Summary: Until June 2014, I’m focusing on work that’s either public or that reaches an audience of 10,000+. I’m celebrating my 30th birthday next month. To get a sense of where I’ve come from and where I want to go, I’ve been reviewing more than ten years of blog posts. If I didn’t have my archive, the years would be a blur. The posts help me remember the significant events that happened, and then I can remember other details around those. Here is something I’m starting to realize: Whatever isn’t written down—whatever isn’t published—gets forgotten. Private notes? Lost in computer migrations and disorganized files. E-mail? Too many to go through. Photos? Few and far between. Things I’ve shared with other people? That comes back, even when I’ve completely forgotten about sharing it in the first place. There’s this amazing thing that happens when you have an external brain: people make the connections for you. People comment on blog posts years after I post them, which is great at bringing things back to mind. Longest gap between blog post and comment: 3,410 days (a little over 9 years!) on this post on literate programming, which I wrote long before Org Mode made it super-easy to publish websites with code. Google Analytics shows me that a post from 2010 still gets more than a thousand views a month, and quite a few older posts get hundreds of views a month. My oldest source code available on the Web? This fractal-drawing program I wrote in 1997, when I was in high school. People help me remember and inspire me to learn more. Good things probably also happened with the confidential workshops and projects that I worked on, but it’s harder to point to them and say, “Oh, that’s where those years went.” The things I’ve shared help me feel that I put the time to good use, especially as they keep providing value. Now that I’m on my own, I can choose what to spend my time on. One of the decisions I’ve been working my way through is whether I should work (almost) exclusively on open things: ideas, code, and resources that I can share with other people. What if I stop accepting requests for confidential work, and focus instead on what can be opened up? I have the space to do that, and it makes decisions so much easier. I can make an exception for work that meets my desire for scale – perhaps directly affecting more than 10,000 people (even with a small effect) in a searchable, semi-public way. For example, I still hear from IBMers who come across the blog posts I shared on the intranet, and that makes me happy. As for small-scale confidential work… other people can handle that, and they can handle that happily. What would I give up by focusing on only open projects? I might not get a behind-the-scenes look at interesting industries or topics. Sketchnoting is great because it’s a good reason to get into events that I would probably never get to attend or present at on my own. Many events have a closed audience (no public recordings/notes, etc.) to maintain the value of event attendance or provide participants with a more open forum. By focusing only on public events, I’ll skip those closed events… but chances are that I wouldn’t get as much personal value from them anyway, and I can always read or talk to people outside my usual fields. I’ll reduce my income potential. More money helps me increase my buffer, which reduces risk and improves my ability to take advantage of opportunities. Still, I can keep my expenses low, and I can invest in getting even better at creating value through pay-what-you-can resources. I don’t need the money from these other engagements, so I can experiment more. 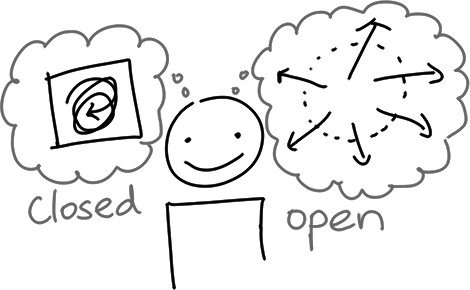 What are the benefits of focusing on openness? I like the people I work with. People who understand the awesomeness of sharing tend to be awesome themselves, and I also benefit from great conversations with lots of other people. We get tons of value from the things I create. The value isn’t just limited to the particular event or solution, but goes on and on. I have more long-term growth potential. I don’t have to worry about what I’m allowed to share or not allowed to share, and I can build on the things I’ve created. Can we share the results publicly, or with an audience of more than 10,000 people? Consider for “yes”. If not, politely decline and refer to someone else. If exceptional circumstances come up (say, something happens to W- and I need to return to work), I can change my mind about this, but let’s give it a try.